Porsche 911 fanboys: it's time to give this a try. The C7 Corvette Stingray was launched back in 2013. From the get-go it was clear the new Vette was leaps and bounds better than its predecessors. Let’s put it this way: calling it the "Plastic Fantastic" is no longer necessary. 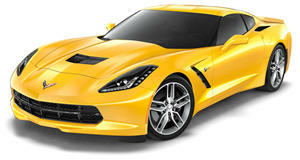 The C7, as we all know by now, has become a truly world class high-performance sports car, American style. Power, of course, comes from a small-block 6.2-liter V8 (now called the LT1) with 455 hp and 460 lb-ft of torque. Our tester 2016 Corvette Stingray was equipped with the optional eight-speed automatic instead of the standard seven-speed manual, along with the $9,745 3LT Package. Other goodies include the $995 carbon fiber package, Magnetic Ride Control, and the nifty carbon fiber dual roof package. Although the C7 carries a base price of $51,400 (still a bargain no matter what anyone says), our car came to a grand total of $78,195. And yes, that’s still a solid deal considering its longtime rival, the Porsche 911, only begins at around $80 grand. But is the 911 still the Corvette’s real rival? Is there another Porsche that’s more in line with the C7 Stingray? And does Jaguar also add something to the mix? There’s lots to talk about here, so enjoy the review. Special thanks to DGDG.com for letting us film the car.